Movies about London’s Pakistani community are so rare that My Beautiful Laundrette still carries the charge of something fresh and exciting, three decades after it was originally released. Written by Hanif Kureishi, who up until that point had worked primarily as a playwright, it tells the story of Omar (Gordon Warnecke), a young man whose prosperous uncle, Nasser (Saeed Jaffrey), agrees to help get him started in business by allowing him to manage a dilapidated laundromat (“laundrette,” in British English). The movie has elements of a coming-of-age saga, a gay romance, a drug-smuggling thriller, and a redemption tale, but it works first and foremost as a portrait of a milieu that had previously been all but invisible onscreen, and that remains so to this day. Kureishi would go on to write and/or direct other projects in a similar vein, including The Buddha Of Suburbia (1993) and My Son The Fanatic (1997), but none has matched the broad appeal of Laundrette. Its induction into the Criterion collection feels long overdue. Being a landmark British film doesn’t necessarily entail being a masterpiece, however. Kureishi has never been an especially graceful writer, especially of dialogue; his characters often speak as if they were reading aloud, in a way that’s unnatural even for someone’s second language. (“Your family, rich and powerful back home, is being let down by you,” intones someone here, even as he’s stepping on the head of the person to whom he’s speaking.) And to call Laundrette’s narrative ungainly would be an understatement. The movie runs just 98 minutes yet boasts enough subplots to fuel a mini-series (the route Kureishi would later take with Buddha Of Suburbia), from Nasser’s extramarital dalliance with a white woman (Shirley Anne Field) to the whole business about Omar financing a full-scale remodeling of the laundrette by stealing drug money from his cousin Salim (Derrick Branche). Director Stephen Frears does his best to keep things moving swiftly, but Kureishi wrote this film as if he feared he’d never be able to write another. Still, My Beautiful Laundrette offers so many pleasures that its overstuffed, incoherent aspects frequently don’t seem to matter. That dynamic is most evident in its central relationship, between Omar and his childhood friend Johnny, played by the young Daniel Day-Lewis (or Day Lewis, as he’s credited here). This was the performance—alongside his startlingly different role in A Room With A View, released the same year—that made Day-Lewis’ reputation, just four years before he’d win the first of his three Oscars to date. And his talent fairly leaps off the screen, even though Johnny doesn’t make a whole lot of sense as a character. Soft-spoken and almost shy, Johnny is supposed to be a reformed fascist thug; he’s introduced refusing to take part when his mates harass Omar and his family, and he later comes to the rescue when Salim is being beaten. Kureishi doesn’t include any flashbacks, however, and Day-Lewis seems reluctant to suggest any lingering anger or resentment in Johnny. Even when he fights, it’s with a grim resignation, encapsulated by the businesslike way he removes his wristwatch to ensure that it won’t get broken. Again, though, this haphazard quality—the failure to make Johnny credible as someone who used to be a skinhead in training—seems nearly irrelevant in the face of Day-Lewis’ sheer charisma. Likewise, while Omar and Johnny’s romance, apparently renewed from their younger days, doesn’t set off any sparks (in part because Warnecke seems so thoroughly harmless), there’s still satisfaction to be found in the casual way the film handles it. 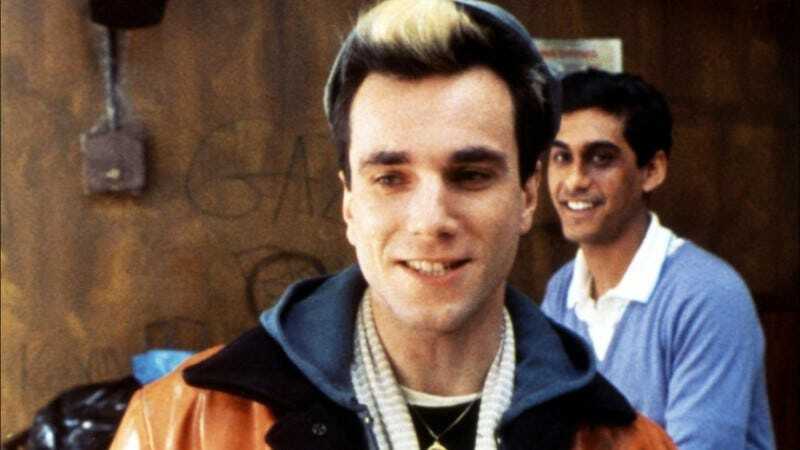 Half the movie elapses before the two kiss, but it’s no big deal when they do; My Beautiful Laundrette treats it as perfectly ordinary, which was all but unprecedented in 1985. Any didacticism is reserved for speeches about Pakistani Brits embracing the capitalist mores of their adopted country, with the refurbished laundrette serving as a grand thematic symbol. And even that material is fairly lighthearted, as heavy-handedness goes. No matter how clumsy the movie gets, it’s always enjoyable just to spend time with these proud hustlers, who stubbornly refuse to lie down and be marginalized.